MJ Fire Safety provide a high quality Fire Evacuation Drills & Training service. We offer part theory, part practical fire warden & fire awareness training courses. Both courses provide fire extinguisher safe usage training. Give your staff the confidence & ‘know how’ to select the correct fire extinguisher and extinguish fires safely and efficiently. The courses will also help you meet your obligation to satisfy the regulatory reform fire safety order. Courses include a short lesson on the theory and classes of fire, when and when not to tackle a fire and the use of fire extinguishers, on a live fire wherever practical. 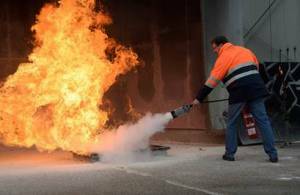 If your workplace is equipped with fire extinguishers you are duty bound to provide your staff with suitable training in the safe use of fire extinguishers. Our fire awareness course will satisfy this requirement. It will also provide your staff with a good understanding of how fires start and how to prevent them both in the workplace and also at home. Our fire warden course is tailored to the buildings policies and procedures and provides fire wardens clear guidance and instruction in what to do in the event of fire and how to satisfy the requirements under the regulatory reform fire safety order where periodic inspections such as weekly tests and recording criteria are concerned. All delegates are provided with certification confirming attendance. Furthermore our live fire rig allows all staff the chance to extinguish real flames with fire extinguishers. Lastly our fire training can be carried out on site or at secondary locations as necessary. Call MJ Fire Safety to discuss you fire training requirements. Alternatively you can contact us by email.